“Americans use billions of aluminum beverage cans every year. The good news is that aluminum can be infinitely recycled back into new cans, and a great deal of energy and other resources can be saved by recycling it. Last year, Americans recycled 61 billion aluminum cans, saving the energy equivalent of 17 million barrels of crude oil. That’s a whole lot of recovered resources! So, how was all that energy saved? To put it simply, manufacturing cans from recycled aluminum consumes 95 percent less energy than using virgin materials. To put those figures in perspective, recycling one aluminum can saves enough energy to keep a 100-watt bulb burning for almost four hours or run your television for three hours. “MOSHAV AHITUV, Israel (Reuters) – A bicycle made almost entirely of cardboard has the potential to change transportation habits from the world’s most congested cities to the poorest reaches of Africa, its Israeli inventor says. Yeah, we’ve heard about green buildings.. but green roofs too? SEATTLE, WA — “The Justice Center’s 8,500 square-foot garden roof was completed in 2002. Starbucks Coffee has been one of the most successful coffee chains in the U.S. to date. Let’s face it, the coffee’s great & the prices are good. But wouldn’t you enjoy your morning brew more knowing that the location you get it from is constructed of locally sourced material? The Seattle based company is pushing for a new “modular-modern” design which happens to be LEED certified as well. This means that each location will have been constructed of locally sourced material (within a 500 mile radius), getting rid of the typical lounge style, laptop-friendly interior. ommodate about 5 employees & all necessary brewing equipment. 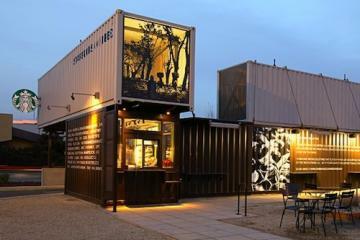 Starbucks’ goal is to entice customers in providing them with a location that will resemble certain elements from their local environment.